Several million Somalis live scattered across eight countries in the northeastern portion of Africa and the Middle East. They are one of the most homogenous people groups in Africa, speaking a common language, adhering to a single faith, and sharing a cultural heritage. 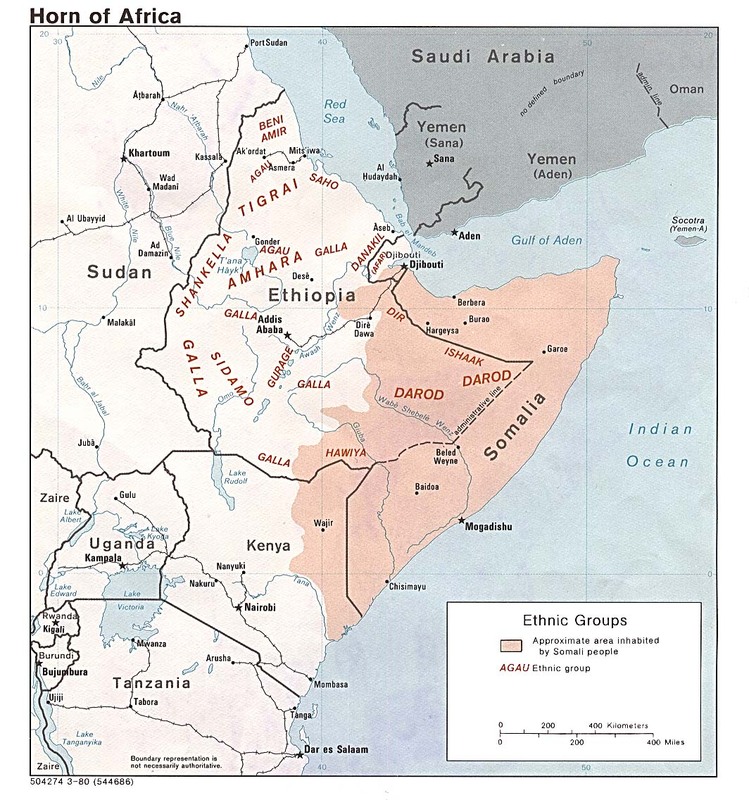 Somalis first appeared in Africa around 1200 A.D., and began expanding westward and southward about 150 years later. They converted to Islam around 1550, under the influence of Arab traders. Today, the Issa branch of the Somali represent the largest ethnic group in Djibouti and make up nearly one half of the country's total population. In 1884, the territory was occupied by France and given the name "French Somaliland." It was not until 1979 that independence was regained. Bordered by Ethiopia and Somalia, Djibouti has been greatly affected by tensions between the two countries. Refugees from both Ethiopia and Somalia have fled to Djibouti since 1975. Djibouti, a tiny republic, is one of the hottest places on Earth, with an average temperature of nearly 90 degrees F. The yearly rainfall is less than five inches, so vegetation is sparse. Date palms are grown on some small plots of irrigated land, and there is a small fishing industry; but these do very little to help the struggling economy. Salt that has been extracted from the sea is Djibouti's only major resource. Almost all consumer goods must be imported. This impoverished nation is dependent on foreign aid for survival. One-fourth of the Somalis in Djibouti have continued living as nomadic shepherds, even though less than one-tenth of the land is suitable for grazing their cattle, sheep, and goats. Scorching heat, scarcity of water, and a shortage of grazing lands make life difficult for the nomads; however, poverty and a huge unemployment rate plague those in the cities. Somalis are usually characterized as being very individualistic; scornful of danger, hunger, or thirst; and constantly involved in blood feuds with other tribes and peoples. They speak the Somali language, although the official language of Djibouti is French. Nomads generally live in branch-framed, portable huts. They are covered with woven mats or boiled bark that has been pulled into fine strands and plaited. These may be carried from place to place on camels. Quality housing is in short supply in the cities. Only about half of those in cities and one-fifth of the rural population have access to water. Malnutrition is severe, many have tuberculosis, and malaria is an epidemic. The basic building block of Somali society is the family. Each man has the right to be married to four women. The divorce rate is high. The mother raises the children, although the father takes part in their religious training. Respect for one's elders and maintaining integrity are strongly emphasized. The Somalis are Sunni Muslims, and their faith is an integral part of daily life. In the cities, groups inspired by the Egyptian Muslim Brotherhood have appeared, establishing a more orthodox form of Islam and criticizing the government for its lack of moral standards. Religious experts (wadaads) are often sought out for blessings, charms or advice in worldly matters. Life is difficult for both the city-dwellers and the nomads. Poor living conditions, a depressed economy, drought, malnutrition, and disease are among the problems the people face day after day. Educational opportunities are also extremely limited, with only one-tenth of school-age children receiving any education at all. There are no universities, and only about one-third of the adults can read. The country's spiritual condition is just as dismal. Very few of the Somalis in Djibouti are Christians. Only the Truth of the Gospel can set them free from the bondages of sin, sickness, and poverty. * Scripture Prayers for the Somali, Issa in Djibouti. * Ask the Lord to raise up Christian teachers who will work among Somalis and share Christ's love with them.